NTC temperature control feature ensures the perfect brew. Not ideal for large servings. Using a Hamswan Coffee Maker gives us a lot of options in the way of how to brew our coffee. It also offers self-cleaning features, which is simply amazing. No one likes to clean up. Hence, the little cleaning there is left to be done, the better. So, with all this in mind, we have no choice but to say that Hamswan is the better product. 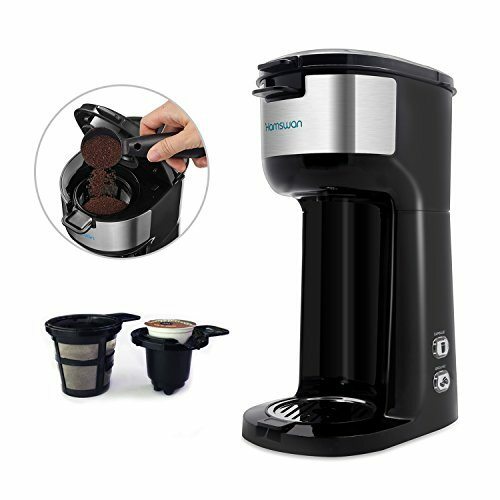 HAMSWAN Coffee Maker is a wonderfully compact single-serve coffee machine – perfect for your counter-top. Brewing a cup of coffee these days is as easy as it gets. In fact, if you think about it, we don’t actually brew the coffee by ourselves. We’ve got machines and home kitchen appliances that practically do the entire job for us. All we need to do is just press a button. True, there might not be a whole lot that we actually do, but we can still talk a little bit about what we actually do. For example, we still have to put the coffee in the coffee brewer, and we mostly have two choices in this matter. 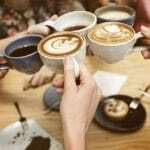 Should we use ground coffee or coffee pods and capsules? Using coffee pods can really make our lives easier. In the case of ground coffee, we tend to scoop the ground and slap it in the filter. After the ground has been used up, we have to take the filter out, wash it up and place it back. However, in the case of buying coffee pods, which are disposable, by the way, we can just pop the pods out and toss them in the trash, and we’re done. The convenience of using a pod might be attractive to some people. 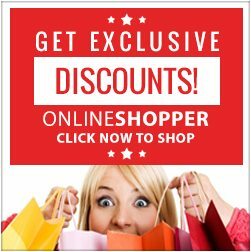 However, there are a number of disadvantages to consider as well. One is that the convenience comes at a high cost. Also, choosing a pod usually means sacrificing on the quality and freshness of the coffee. Freshly ground coffee beans will always taste a little fresher. Thus, that is something to keep in mind when making that decision. 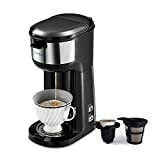 Now let’s move on to the main topic of our article and discuss a coffee maker that supports ground coffee beans as well as coffee pods or capsules. As mentioned earlier, Hamswan Single-Serve allows you to choose between convenience and quality—a feature that each and every one of us would simply love. 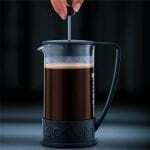 The best thing about using this quick brewing coffee maker is that you can use either a coffee ground or a coffee pod. So, if you’re running late or simply don’t feel like making an effort, you can opt for a coffee pod. This nice little model comes with its own stainless steel mesh filter. Unlike paper filters, it is not fine enough to catch everything that is poured into them, but that’s not really a bad thing. 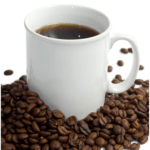 Extra-fine paper filters can filter out oils and micro-fines which can significantly alter the taste of your coffee. The oils are responsible for carrying a ton of flavor to seep into your coffee. On the other hand, the micro-fines are granules of coffee that are responsible for the darker and cloudier appearance of coffee. They’re also responsible for making your coffee rich and bold—it is as if you were drinking coffee that was brewed in a French press. Therefore; the filter you use for your coffee maker can really alter your experience with coffee. 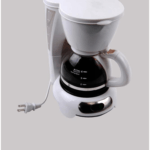 This single cup coffee maker also features an automatic cleaning system and a detachable drip tray. In order to clean the coffee maker, all you have to do is just press the self-cleaning button. Consequently, you can also pull the drip tray out for a quick wash, and you are practically done with all of the cleanings. In addition, the coffee maker comes with a built-in, safe-use feature. 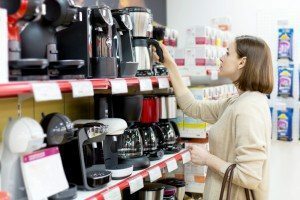 If you turn a coffee maker on without putting enough water in it, chances are your coffee maker will heat up with potentially dire consequences. However, in the case of Hamswan Single-Serve, it simply wouldn’t turn on when the water you put is not enough. An important feature considering that a lot of us tend to make coffee while still half asleep. Lastly, we have the NTC temperature control feature. In order to set the ideal temperature for brewing coffee, the coffee maker first heats the water up before starting the brewing process. This ensures a degree of quality and care that most machines simply don’t offer. 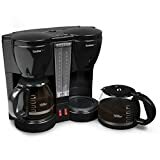 All in all, this single serve coffee maker is an amazing product with great customer reviews. It barely takes up any space on your kitchen counter top. 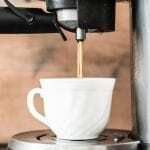 It also offers a degree of convenience that most coffee makers don’t. Additionally, it is effortless to maintain. 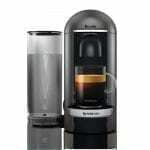 Moreover, it supports a number of different types of coffee pods, including the popular k-cups. Nevertheless, the best part is that none of these conveniences come at the cost of good-tasting coffee. 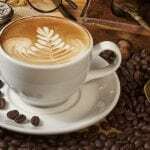 Meaning, you can expect the same quality of coffee while still enjoying these conveniences. 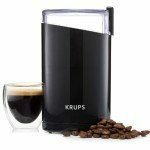 As we’ve discussed in considerable detail, every tiny aspect of this coffee brewer works to provide a rich, flavorful and aromatic cup of coffee. 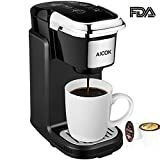 Let’s look at another single-serve coffee maker, the Aicok Single Serve Coffee Maker, in order to get a better perspective on what’s good and what’s not about this product. 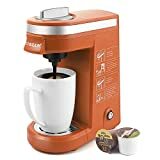 This coffee maker only supports single-cup pods but is quite small in size, and its compact design looks pretty good as well. In fact, it’s so small that you could even pack it in your luggage during your travels, though we wouldn’t recommend such a thing. Also, it has an auto-shutoff feature, which turns the coffee maker off as soon as it is done with the brewing cycle. Based on all of the information we’ve covered so far, it would be difficult to ignore some of the amazing features that the Hamswan Single-Serve Brewer offers. 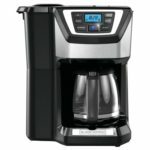 There is no doubt that Aicok Single Serve Coffee Maker is a good coffee maker, but it simply doesn’t stand out in front of HAMSWAN. Yes, the Aicok does have some features that Hamswan lacks but overall the Hamswan single serve is simply a better coffee maker.